Newfoundland Dogs, invariably called the gentle giants, the aristocrat among dogs. They are certainly the gentle giants, so sweet natured it is easy to forget that they are in fact, dogs. I have lost count of the number of times I have received emails asking about Newfoundland Dogs, from people who really, really want to get one. I always start by telling them their bad points, though these are not bad points to me, just a minor inconvenience. The first thing to remember is that the majority of them drool! I have heard of newfies who do not do this, but mine do, and in vast quantities. Unfortunately, it is not something you will know until they get older. They drool on my clothes when they lay their heads on my knee, they shake their heads and I get little ribbons all over the walls, the cupboards, the furniture. There is nothing you can do about this, so you have to learn to live with it. 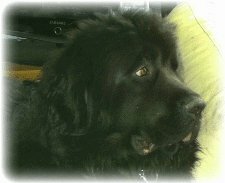 Some people have a serious aversion to dog drool, and if that is you, forget the very idea of owning a newfie. Sometimes they want to go say hello to people who have made the mistake of talking to them from a distance, and I can see they are dressed for an occasion and have to hold them back. Any other bad points? That depends on your point of view. Newfoundland dogs are excessively hairy and will leave fur everywhere, on your carpet, on your cupboard handles, in your dishwasher, upstairs even if they never go there. Their fur is waterproof and it will stick to absolutely everything. I have found that only a wool carpet will do, as it is impossible to get the hairs off anything else. The one thing I have found which puts most people off is when they realise just how big they will be. My Ferdie is 80kg, about 180lbs. Very often, after everything I have told them about their wonderful nature, people will say: "I didn't realise they got that big!" When you decide to buy a Newfoundland dog, you are buying a giant breed. He is going to be enormous! If you have fallen in love with the idea of a newfie, if you want all the facts about them, you have come to the right place.